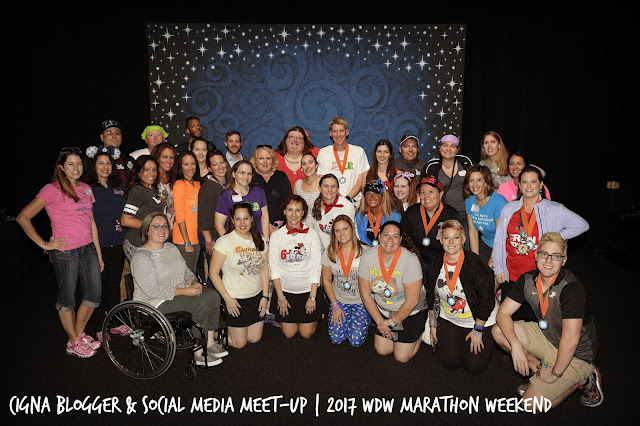 During the 2017 Walt Disney World Marathon Weekend, I was invited to attend the Cigna Blogger and Social Media Meet-up on the day of the 10k- Friday. 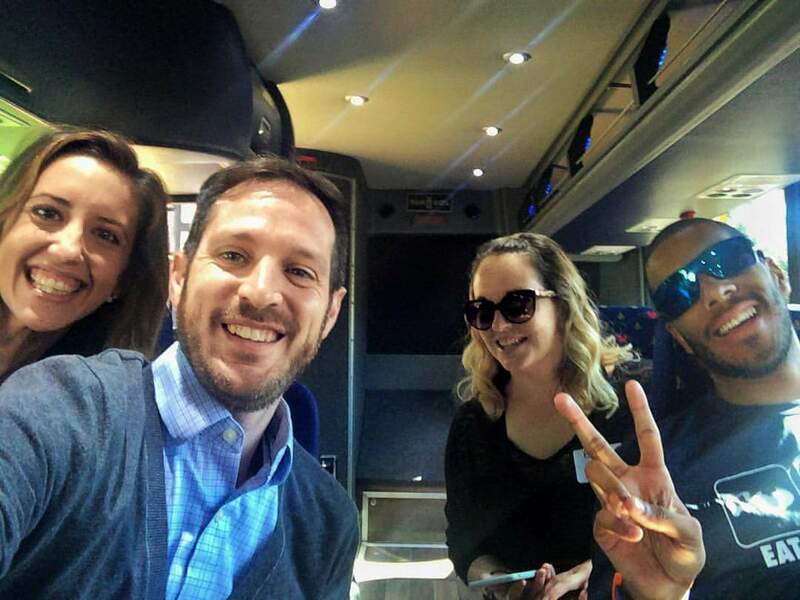 With instructions to meet at the Grand Floridian Resort, I boarded a bus with some of my favorite bloggers- Justin, Gelcys, Emelia, Sharpie- and headed to Sunset Showcase at Hollywood Studios. All the cool kids sit in the back of the bus. Photo: Justin. We arrived at Sunset Showcase (a huge building tucked into the back of the park) and were treated to a healthy lunch as we learned what "Cigna's Great Race" was all about. Basically, we were split into teams of 7-8 people and given a bag of supplies, clues, and other random things we'd need for the race. Each team had a Cigna guide that would take pictures for our group. 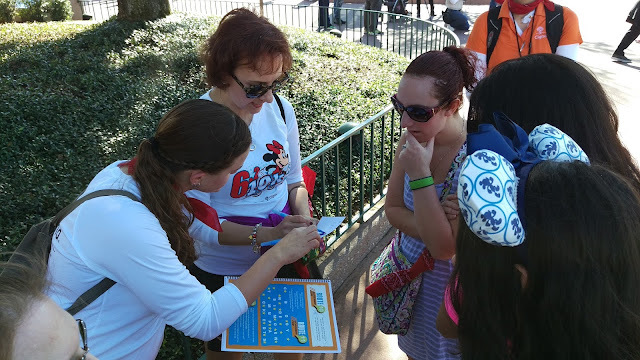 The goal of the game was to solve all the riddles, collect various items around the park, and get pictures or video doing various tasks in different places in the park in just under 90 minutes. 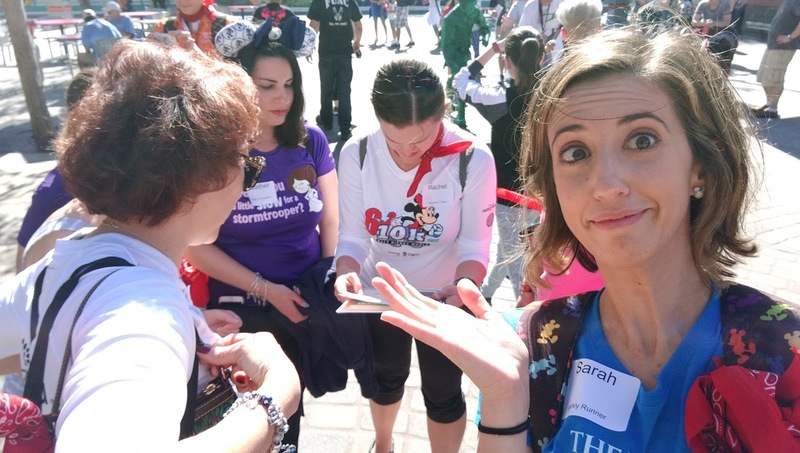 I was on Team Mickey with several other fitness/Disney enthusiast bloggers and we set off right away into Hollywood Studios, clues in hand. Some of the clues involved finding another team to participate- for example, we had to grab another team, go to a certain location in the park, and play a childhood game with them. We found Team Minnie and played "Red Rover." I have to admit, it was pretty fun! It's probably been 25 years since I played a school yard game with friends. Team Mickey, ready to dominate! There were at least 10 riddles we needed to solve for clues and some of them really stumped us! In addition to the clues, we also were charged with completing physical challenges: hold tree pose for 20 seconds as a group; collecting various items: condiments, gum, a healthy snack, etc. ; and finding people to take a picture with: someone celebrating their birthday. After literally running through the park to get back to Sunset Showcase on-time, I was exhausted and sweaty- it was pretty warm that day! Luckily there was more dessert, a fun visit from Mickey and Donald, and the announcement of the winners in the cool, air-conditioned Sunset Showcase. Spelling a healthy word.... looks like... run? Don't remember the clue but the answer is FISH! Trying to gather those damn clues. Team Mickey ended up in third place, only missing a few of the clues. They gave the answers to all the riddles so we were able to figure out the ones we missed. After some group photos, they bused us back to Grand Floridian Resort where a few of us shared some adult beverages and relaxed for a bit before parting ways and preparing for the last two days of races. This was such a well-organized and fun event. 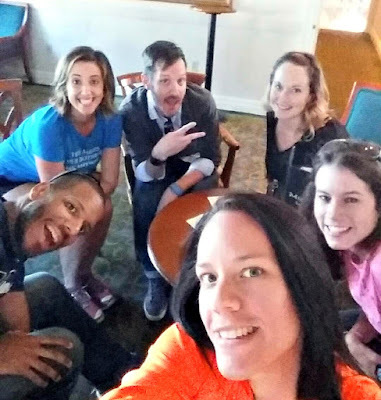 I loved getting to spend time with friends and meet some new bloggers. And it really was a blast running through the park collecting clues and solving riddles- even when we couldn't figure out what the heck some of them were. HUGE thanks to Cigna for sponsoring Walt Disney World Marathon Weekend and for hosting this awesome meet-up!